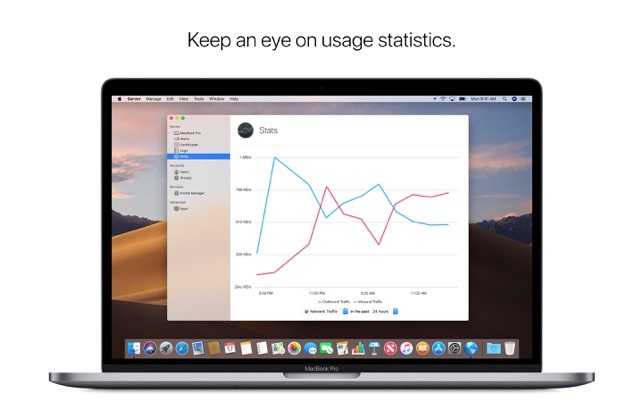 macOS Server makes it easy to configure and monitor Mac, iPhone, iPad, and Apple TV devices and network storage volumes. Run the macOS Developer Beta Access Utility to download the latest macOS 10.14 beta. As new macOS betas become available you will receive a notification and can install them from the Software Updates panel in System Preferences. The macOS 10.14.4 SDK provides support for developing apps for Macs running macOS Mojave 10.14.4. The SDK comes bundled with Xcode 10.2 available from Apple Developer. For information on the compatibility requirements for Xcode 10.2, see Xcode Release Notes. Apple News will be available in Canada with macOS 10.14.4, and is now available for Canadian users on the developer beta. Apple News in Canada supports both English and French. Readers can access a bilingual experience when they follow a channel in a second language. You will lose your previous Safari settings after running the command above. tvOS 12 introduces long-awaited support for Dolby Atmos, and when tvOS 12 launches this fall, iTunes will be home to the largest collection of Dolby Atmos-supported movies. As with the launch of 4K HDR, previously purchased content will be upgraded to include Dolby Atmos on all supported titles at no cost. tvOS 12 features a zero sign-on option that lets cable subscribers watch live channels and on-demand programs they’re entitled to through their cable subscription simply by being logged into their home internet networks. This feature will be limited to Charter Spectrum users to begin with, but Apple plans to expand it to additional providers in the future. Other tvOS 12 features include the ability to autofill passwords from the iPhone to sign into Apple TV apps more quickly, and support for Home Control systems like Crestron and Savant, which will be able to be used to control the Apple TV. Apple has also made the Apple TV Remote a default option in Control Center on iOS devices with the iOS 12 beta, there are new aerial screensavers created with help from the International Space Station, and aerial screensavers now offer up location information. Install the configuration profile directly on your device to receive OTA updates for Apple TV 4K or Apple TV (4th generation). The tvOS 12.2 SDK provides support for developing tvOS apps for Apple TV devices running tvOS 12.2. The SDK comes bundled with Xcode 10.2 available from Apple Developer. For information on the compatibility requirements for Xcode 10.2, see Xcode Release Notes. There are no release notes for SDK changes in this software update. San Jose, California — Apple today previewed watchOS 5, a significant update to the world’s most popular watch, helping users stay healthy and connected. Apple Watch becomes an even stronger companion for fitness, communication and quick access to information with a host of new features including Activity Sharing competitions, auto-workout detection, advanced running features, Walkie-Talkie, Apple Podcasts and third-party apps on the Siri watch face. Install configuration profile directly on your device to receive OTA updates. The watchOS 5.2 SDK provides support for developing watchOS apps for Apple Watch devices running watchOS 5.2. The SDK comes bundled with Xcode 10.2 available from Apple Developer. For information on the compatibility requirements for Xcode 10.2, see Xcode Release Notes. Siri doesn’t work in watchOS simulators.